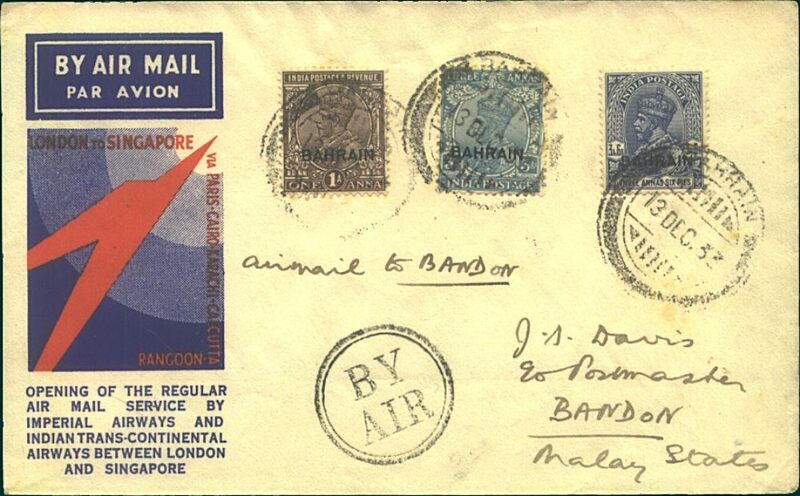 First flight Imperial Airways alternative route through Trucial States, Bahrain to Karachi, bs 8/10, cover with 'Eastern Bank/Bahrein/Ltd' embossed on the flap, franked 3 annas 3p Indian stamps, weak strike Bahrain cds, black double ring 'By Air' hs, dark blue/white airmail etiquette. 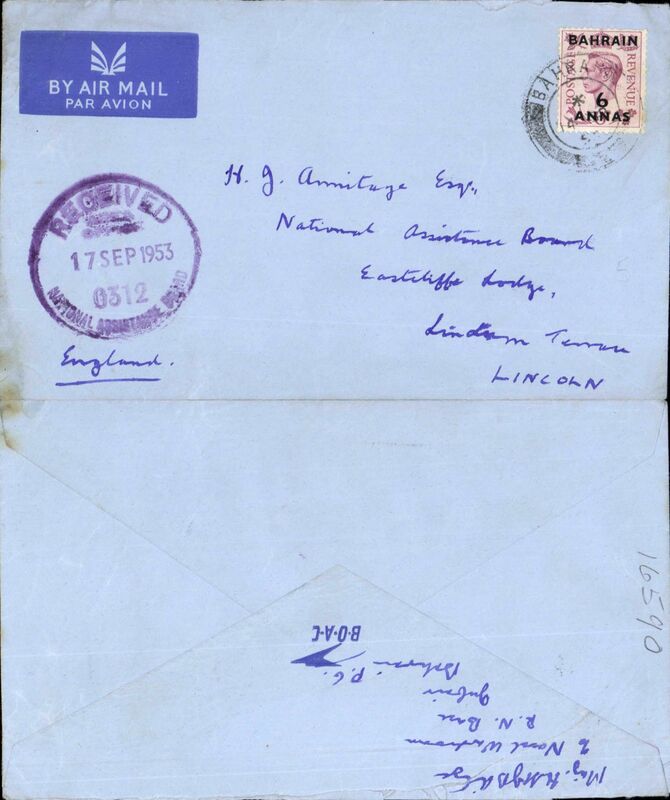 Although 'Bahrein' on the postmark is illegible, the date '5 OCT 32' is clear, as is the '8 OCT 32' Karachi arrival cds. Also the cover is franked correctly with Indian stamps and was sent from the Eastern Bank, Bahrain. A scarce item in good condition. 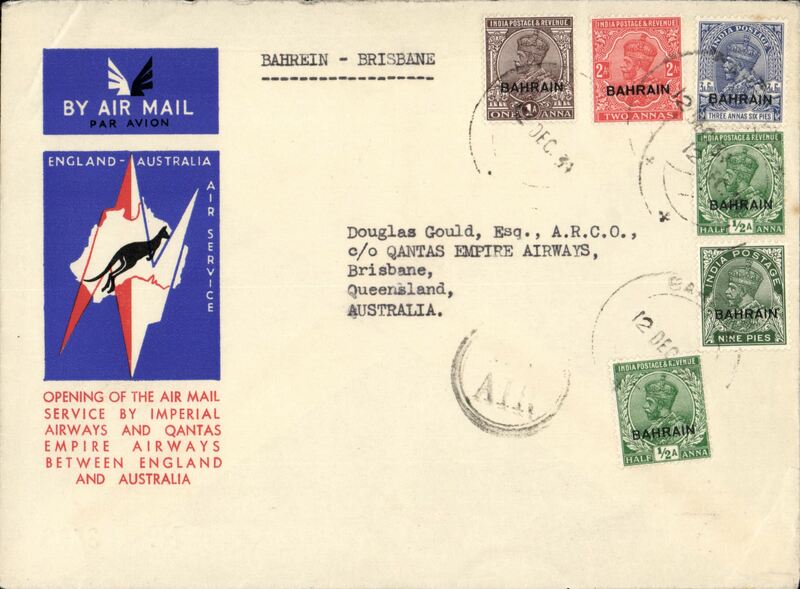 First acceptance of mail from Bahrain for Australia for carriage on the first regular Imperial Airways/Qantas Australia-England service, Bahrain to Brisbane, bs 21/12, official souvenir red/white/blue 'Kangaroo' company cover, franked Bahrain opt on KGV 1/2ax2, 2a, 3a and 3a6p, . circular "By/Air" cachet on face . Scarce. 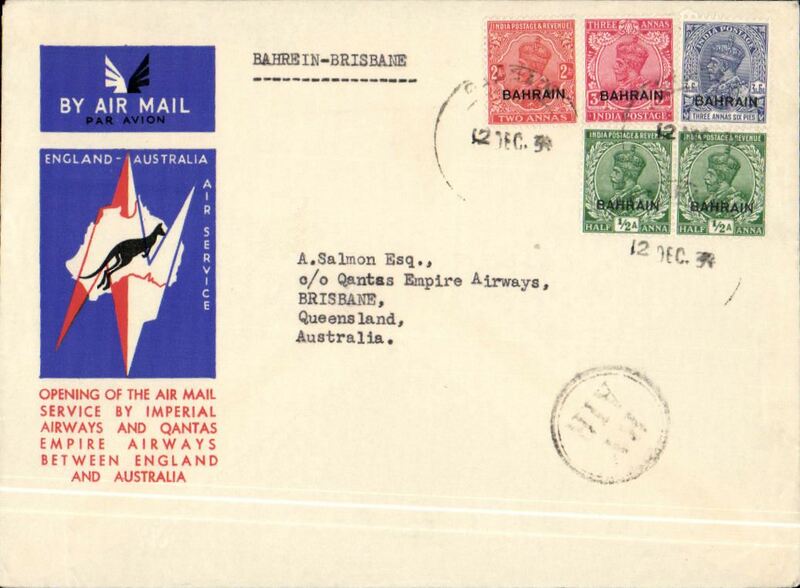 First acceptance of mail from Bahrain for Australia for carriage on the first regular Imperial Airways/Qantas Australia-England service, Bahrain to Brisbane, bs 21/12, official souvenir red/white/blue 'Kangaroo' cover, franked Bahrain opt on KGV 1/2ax2, 1a, 2a, 3a6p and 9p, partial strike circular "By/Air" cachet on face . 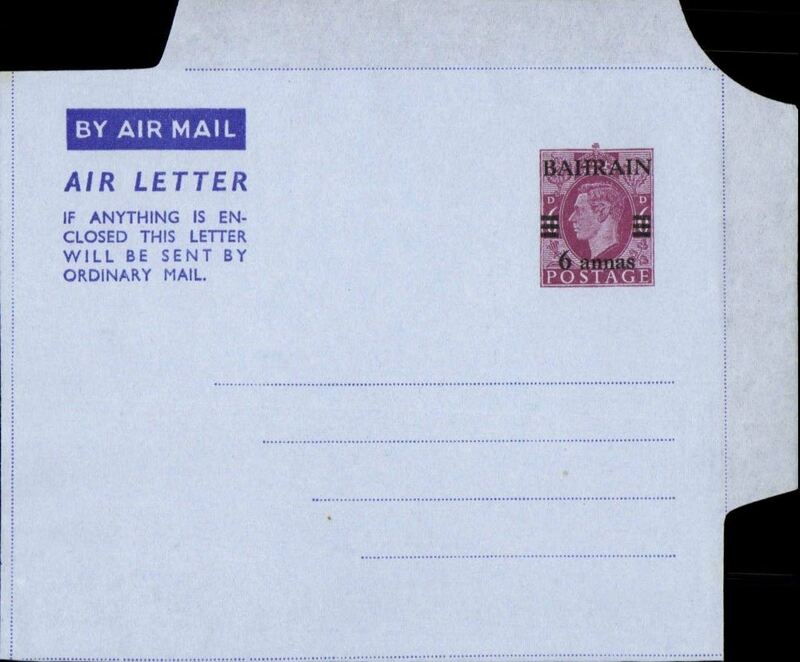 KGVI 6d air letter, franked 6d opt 'BAHRAIN/6 annas', unused. 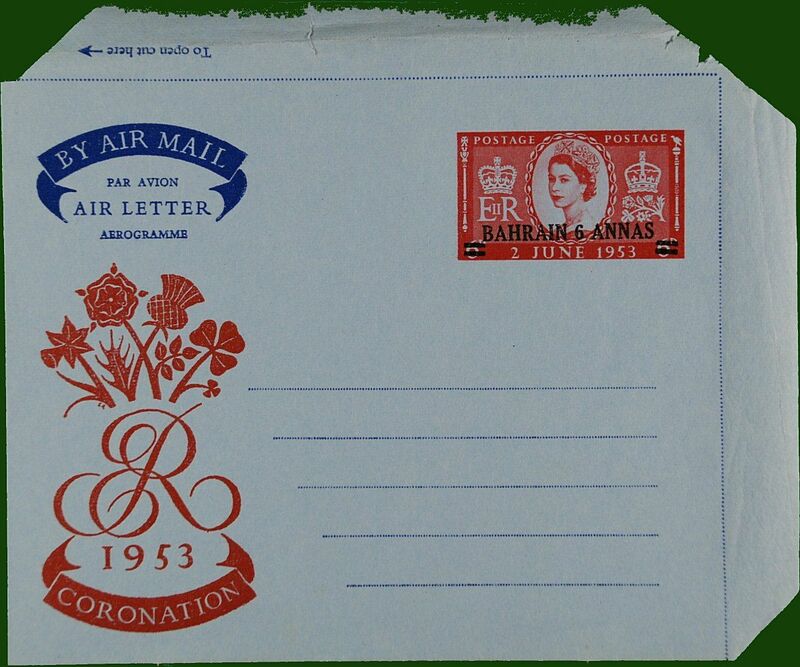 Air letter unused, pale blue/maroon, imprint GB QEII 6d opt. Bahrain 6 annas, imprint 1953 Coronation logo. 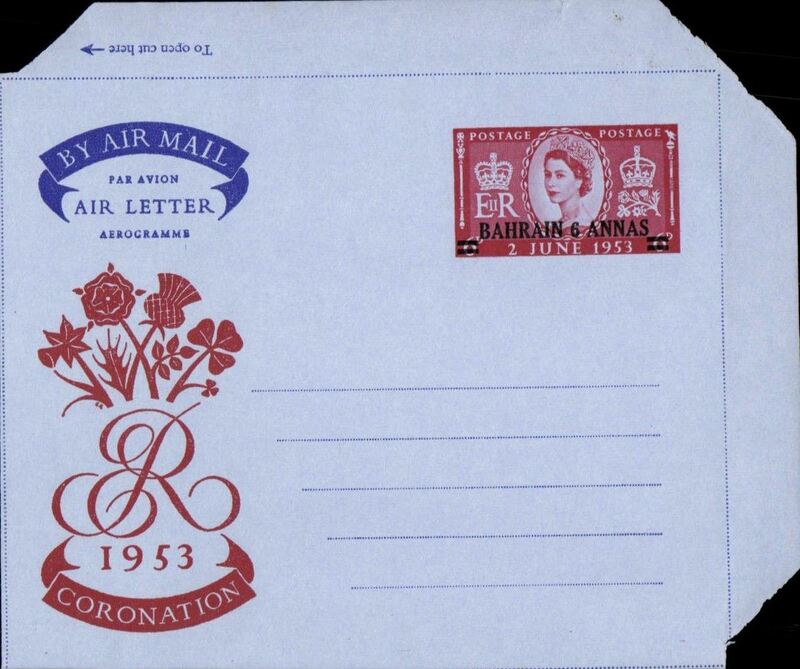 BOAC imprint etiquette air cover to England, 17 Sep 1953 company arrival ds on front, franked GB KGV 6d/6anna opt, canc Bahrain cds, BOAC blue/pale blue cover with company logo on flap. 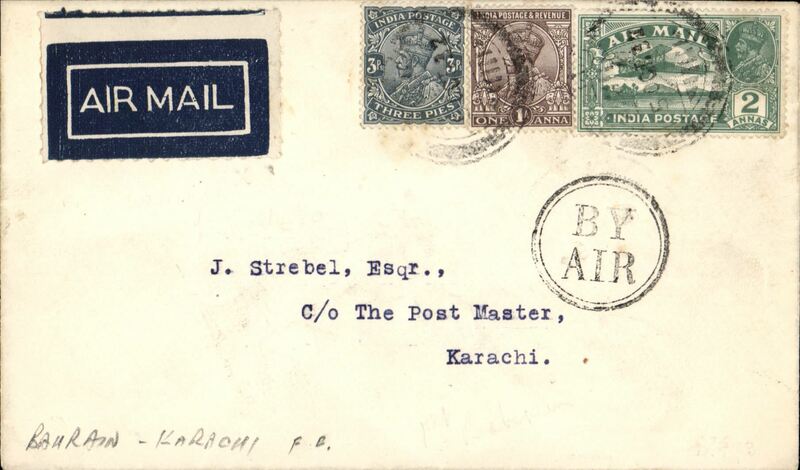 Imprint etiquette air cover to Karachi, bs 8/12, franked GB opts. 4 annas, canc Bahrain cds. 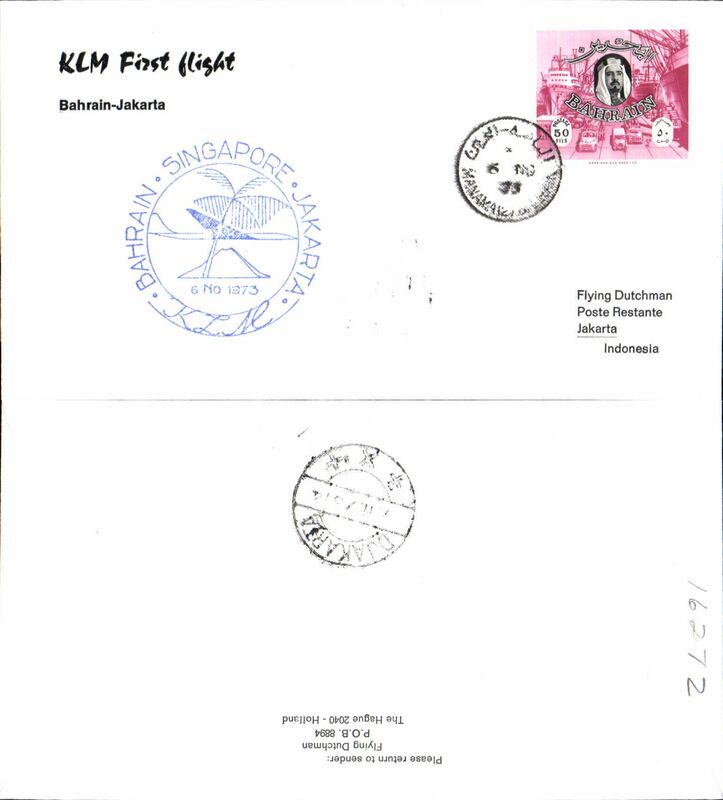 KLM Flying Dutchman F/F Bahrain-Jakarta, cachet, b/s, souvenir cover.